I asked Helga if I could reproduce HER tutorial notes and diagrams to convert a drop shoulder pattern with no shaping into a set in sleeve. She said "Of course you can, I've been teaching this for more than 20 years" I offered to put it into a .pdf for her to offer for sale. She said she doesn't know how to turn a computer on, let alone "do all that" and it would be much easier for me to share it. However, I cannot take credit for her intellectual property, it belongs to her not me, so please respect that. Here are Helga's notes in Arial, my explanations will be in this type. 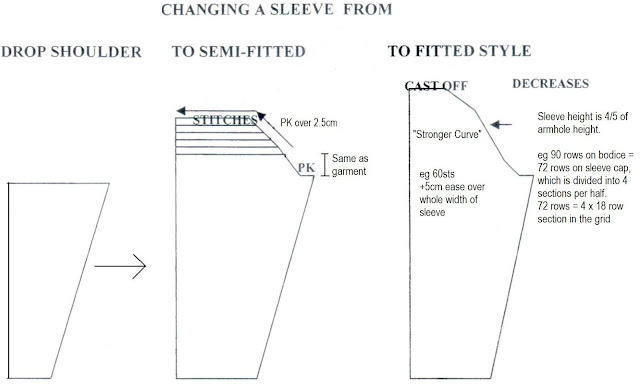 Changing the pattern from a drop shoulder sleeve style to a fitted or semi-fitted sleeve style. 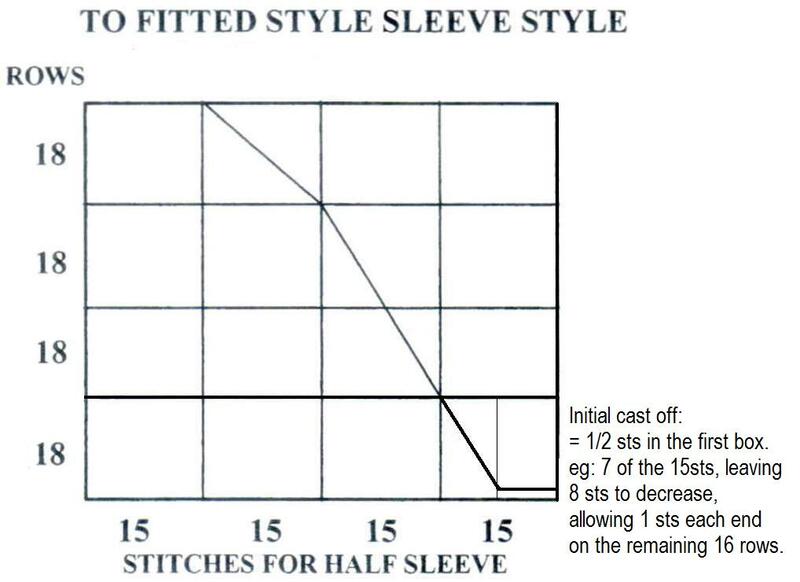 The drop sleeve is the easiest style to write and knit, as it does not provide for ARMHOLE SHAPING, and for this reason often used for tops in pattern books. However it is also the most unflattering style. Having a Shoulder/armhole point makes the garment look more "dressey". - Start by establishing YOUR shoulder width which is the width between the ARMHOLES. 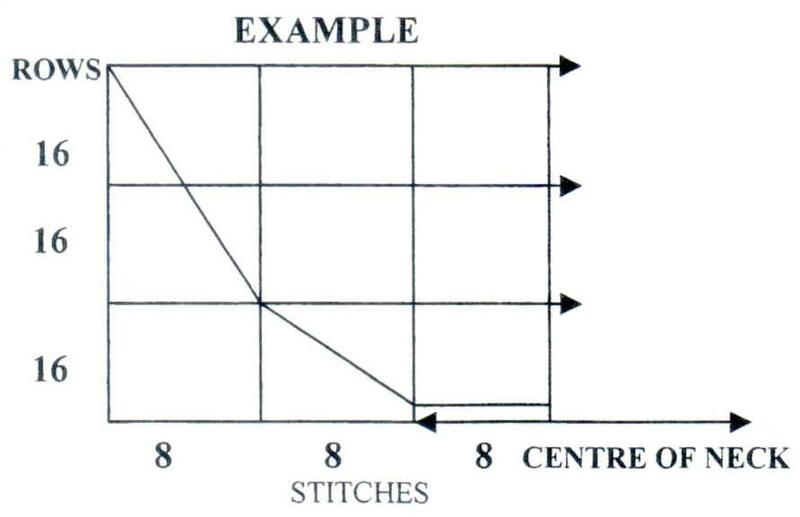 - Subtract that number of stitches from the number of stitches used for the BUST width (not hip width), ending up with the number of stitches you will need to reduce which is the width of the garment at the armhole point. - Establish the number of rows for YOUR armhole and divide 1/3 of that number of rows. Draw a graph of 3 squares wide and 3 squares high. The number of stitches to be used for the cube in my example is 17sts for each armhole. Now: Row counter on 000. - Knit straight to the shoulder point. This method of curving your armhole can be used for the FITTED AND SEMI-FITTED SLEEVE. - if you have too many, you start with every row, changing to every second row so you hit the correct stitch and row count as per the grid. - if you have too few, you start with every second row, change to every three or four rows so you hit the correct stitch and row count in your grid. Most shoulder shaping is over 2.5cm. eg, approx 8-12 rows. 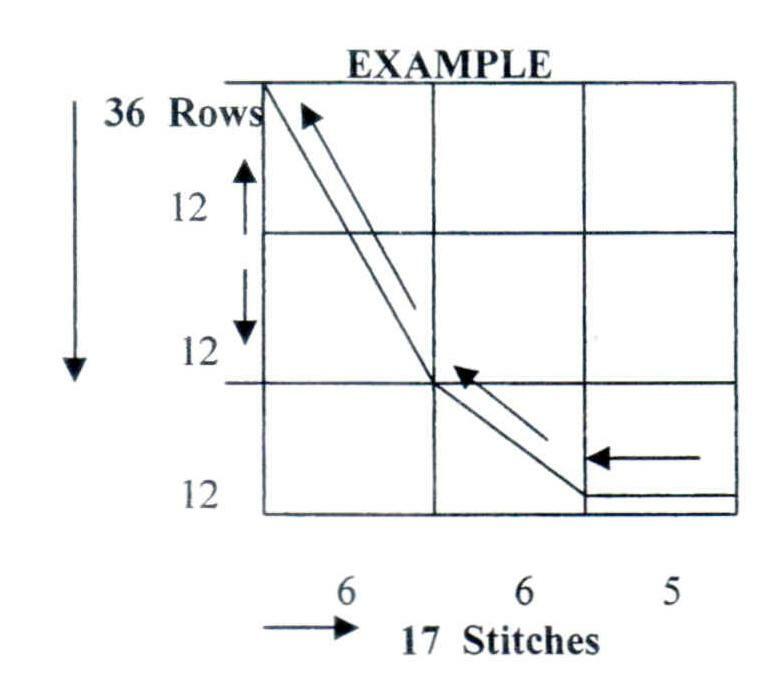 Convert your shoulder measurement into stitches, and divide by rows, say 32 stitches per shoulder in 8 rows (totalling 64), divided by 8 is decrease 8sts each side every row, using short rows, then one final row over all stitches to seal them. Either do a 3 needle bind off or cast off shoulders and sew together. neck stitches can be left on waste/deckers or fine circular, ready for neck ribbing/finishing. 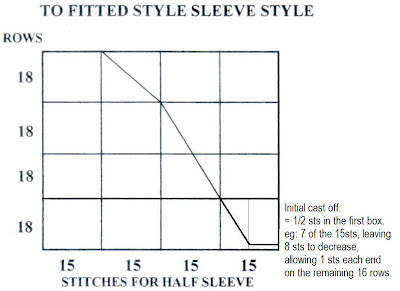 Knit the sleeve in the same way as the Drop Shoulder style to under the arm point. Decrease in exactly the same way as worked on the bodice. Start PK: On an adult sleeve, PK is worked over 16 rows, pushing 4 needles to hold (and wrapping) each time. Knit 1 row over all needles before taking off with waste yarn. The advantage of this sleeve style is that the stitches, taken off with waste yarn, can easily be joined to the armhole edge using the knitting machine or linker. This design sleeve cap can also be knitted from the top down, picking up the stitches, knitting the short rows and matching your armhole shaping. Draw up a graph of 4 x 4 squares. The number of rows for the graph is 4/5th of the bodice armhole shaping, (before starting the shoulder shaping). Cast off remaining stitches (not on WY). Sleeve top needs to be sewn into the armhole by hand. 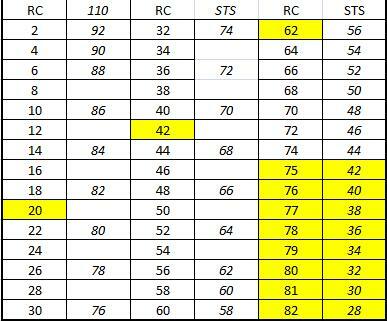 My row chart I use at the machine- all I want to know is what row I have to do my decreases. You may have a favourite pattern that you want to use again, but create a different neck design or you want to make the neckline lower or wider. The standard neck WIDTH for a Lady's garment size 10 to 14 is 18cm; sizes 16-22 is 20-22cm. The standard DEPTH of a cre neck for all Lady's sizes is 7.5cm. The back shaping is straight unless the front and back are scooped design. 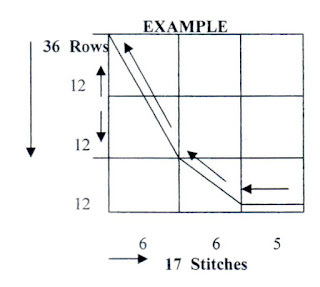 To change the pattern from a Crew Neck to a V-neck, find the number of stitches you need to decrease one each side of the V-neck = NEW V-NECK WIDTH IN STITCHES DIVIDED BY 2. 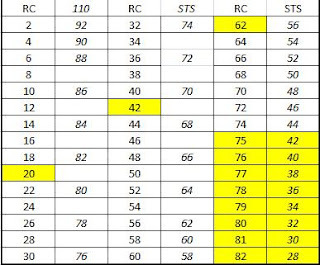 For the NEW DEPTH, find the measurement you want to use and change that into rows. 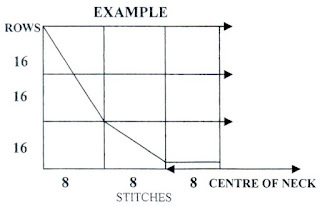 To change the pattern from a V-neck to a Crew neck, find the number of stitches you need to decrease on HALF of the NEW NECK WIDTH. Find the number of rows for the NEW neck depth. That's it everyone, Helga (Guyot) would be thrilled if you used her instructions to make a better fit, however, please respect her intellectual property and acknowledge it. Also please let me know if I need to expand any of the information. It is a lot of info to take in at once, but we had a lovely couple of hours, coffee and we could ask questions as we went. Ozlorna, thank you for the valuable information! These calculations are made in a very accessible manner! I will pass on all comments to Helga. She will be thrilled. Very nice presentation! Thanks, Helga. Thanks, Ozlorna. Thank you Ozlorna for sharing all this very useful information! I'm printing this right now! How generous of Helga to pass this information on so freely! I'm going to print this off and study it. Great article. Thanks for making it possible to share with us.